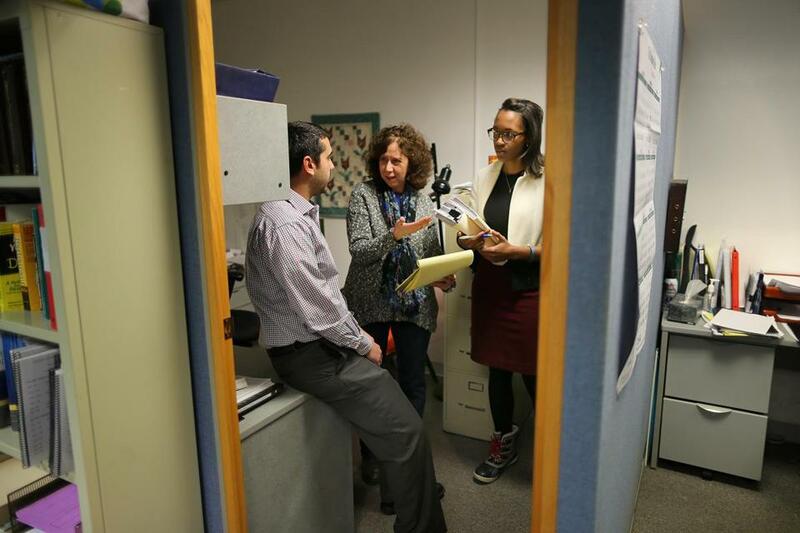 At the Boston Pension Action Center, Jeanne M. Medeiros (center) goes over a client’s paperwork with intern Kevin Medeiros (no relation) and staff attorney Emily Brown. Julia Jackson wired components for a Connecticut electronics manufacturer for a decade, qualifying for its pension plan. Some 30 years later, when she turned 65 and sought her benefits, Jackson was told there was no record she had ever worked for the company. For Jackson, of Norwalk, Conn., it wasn’t a lot of money, about $80 a month, but it was enough to cover the monthly electric bill for her and her disabled daughter. More important to Jackson, the pension recognized the 10 years she had given to the company. Jackson turned for help to the Pension Action Center at the University of Massachusetts Boston, beginning an odyssey of more than two years through corporate mergers, federal bureaucracies, and mounds of records. It took seven months of phone calls and letters to track down just one in the chain of companies that held Jackson’s pension money. Such persistence is the hallmark of the Pension Action Center, a nonprofit that for more than 20 years has helped people find and claim the benefits due them. Since its founding in 1994, the center has helped recover more than $50 million owed to 7,500 retirees. They include people like a merchant seaman whose initial benefit was sharply lower than it should have been, and a widow denied survivor benefits under her husband’s pension plan. For many, the monthly check has meant the difference between living on the edge and finding security in their later years. 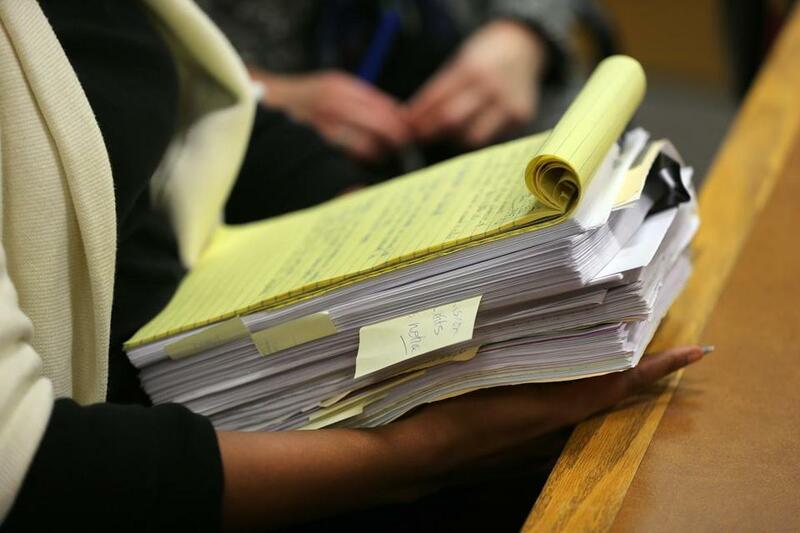 At any given time the center’s staff — Medeiros, another lawyer, four volunteers, and a legal intern — are juggling more than 100 cases. Funded by federal grants, the center provides free services to New England residents. It also covers Illinois under a foundation grant. When you leave a job, the employer must report to the government retirement benefits owed you or your surviving spouse. In many cases, people aren’t aware they are eligible until they file for Social Security and receive a notice that they may be due benefits. No single agency keeps track of all the nation’s pension plans or how much money Americans leave on the table. Medeiros, who joined the UMass center in 1998, estimated that one-third of the nonprofit’s cases involved firms that changed hands, went out of business, or unloaded pension obligations by purchasing group annuities from insurance companies. Such was the case with Jackson, who worked for T-Bar Corp. in Wilton, Conn., from 1974 to 1983 and sought her pension benefits in February 2010, only to be denied. Jackson started with one big advantage: She was a meticulous record keeper, saving pay slips that dated back decades. Key among her records were a 1988 letter from T-Bar announcing it was purchasing an annuity to cover its pension plan and a subsequent notice that the annuity had been bought by United Pacific Life, a division of Philadelphia-based Reliance Insurance Co. The pension center assigned Jackson’s case to Mollie Feeney, a retired state worker who has volunteered as a counselor for 12 years. After seven months of phone calls and letters, Feeney learned that United Pacific Life had been bought by GE Capital, which then sold its insurance unit to Genworth Financial, a Richmond insurer. None of the companies had any record of Jackson working for T-Bar. Next stop: the Pension Benefit Guaranty Corp., a government agency that boasts on its website that it protects the pensions of 44 million American workers. In this case, it entangled Jackson and Feeney in a thicket of red tape. The agency first questioned whether Jackson had taken a lump sum in lieu of monthly benefits. Jackson produced tax forms from 1988 through 1990, none showing a pension distribution. She also signed an affidavit declaring she had not received a payout. The agency then asked to examine her tax forms for 1983 through 1985. Jackson sent those, too. The Pension Action Center at UMass Boston has recovered $50 million since its founding in 1994. By January 2011, when it appeared Jackson had cleared all obstacles, the pension agency posed two more. First, it questioned whether Jackson had worked the full 10 years required for vesting, since she worked only part of her 10th year. Jackson, with Feeney’s help, obtained Social Security records showing she worked more than 1,000 hours in her final year, exceeding the threshold to vest. The agency then demanded the pension’s Summary Plan Description, which is necessary to calculate benefits. It was perhaps the only document Jackson had misplaced, but it shouldn’t have been a problem because employers must file copies with the US Department of Labor. No copy, however, was found. Genworth, the company administering the T-Bar annuity, refused to disclose what it was paying other pensioners without a court order. The pension agency refused to calculate an estimate without such information. The stalemate was broken in the fall of 2011 when the Labor Department finally turned up the pension plan statement. Still, it took several more months of wrangling — including a last-minute demand by the Pension Benefit Guaranty Corp. for her birth certificate — before Jackson, on April 26, 2012, received her first check for $79. Reacting to cases like Jackson’s, Congress established a new position at the pension agency in 2012: Participant and Plan Sponsor Advocate. Jackson’s is not the only case the UMass center pursued for more than a year. In the summer of 2012, a retired merchant seaman contacted the center with a fistful of W-2s that showed his monthly pension benefit was lower than his earnings reflected. The pension center didn’t disclose his name because he requested to remain anonymous. The seaman’s union, the Marine Engineers’ Beneficial Association in Baltimore, administered the pension. It was calculated based on information supplied to the union by shipping companies. After repeated requests by the Pension Action Center, the union agreed in fall 2012 to audit the employer’s logbooks. The company initially balked at the request, but under threat of a union lawsuit released them over the course of 2013. In January 2014, the union sent a 40-plus-page summary to the pension center. Brian Reilly, the legal intern, discovered the company had failed to report to the union 198 days in which the seaman had worked, earnings that would increase the pension. In March 2014 — 18 months after the case was initiated — the union boosted the monthly benefit by $443 to $2,283, and paid the seaman more than $15,000 in retroactive benefits. Medeiros, the niece of the late Boston Cardinal Humberto Medeiros, estimated about a quarter of the center’s clients are widows trying to obtain survivor benefits. In one case, the widow was living apart from her husband when he died. The pension administrator claimed the widow had signed a form waiving benefits. The signature, however, looked nothing like that of the widow’s. Ultimately, the widow received a pension with a cash value of $45,000 after the center showed the waiver was improperly notarized. Maureen Eagan, a retired computer programmer, has volunteered at the center since 2010 and pursued cases that have taken as long as four years. When, for example, one department of the Pension Benefit Guaranty Corp. said it had no record of a client’s former employer, she discovered that another agency department did. Through such doggedness, Eagan has recovered more than $3 million in benefits for 50 clients.